Parallel Lines offers multiple options for audience engagement and participation. This installation creates an opportunity for Visitors to express and share intensely personal issues without necessarily resorting to words. A teddybear, a clock and a bottle of whisky lie upon a man's shirt and underwear — on top of the bed. Beside the pillow, covered with a blanket: a diary, child's moccasins and smokes. At the foot of the bed: a suitcase with a bouquet of flowers and a fuzzy red heart embroidered with the words "I love you". Recognizing that powerful works can stir up deep-seated memories and emotions — partnering with local mental health and/or spiritual counsellors both during and following exhibitions can be very helpful. 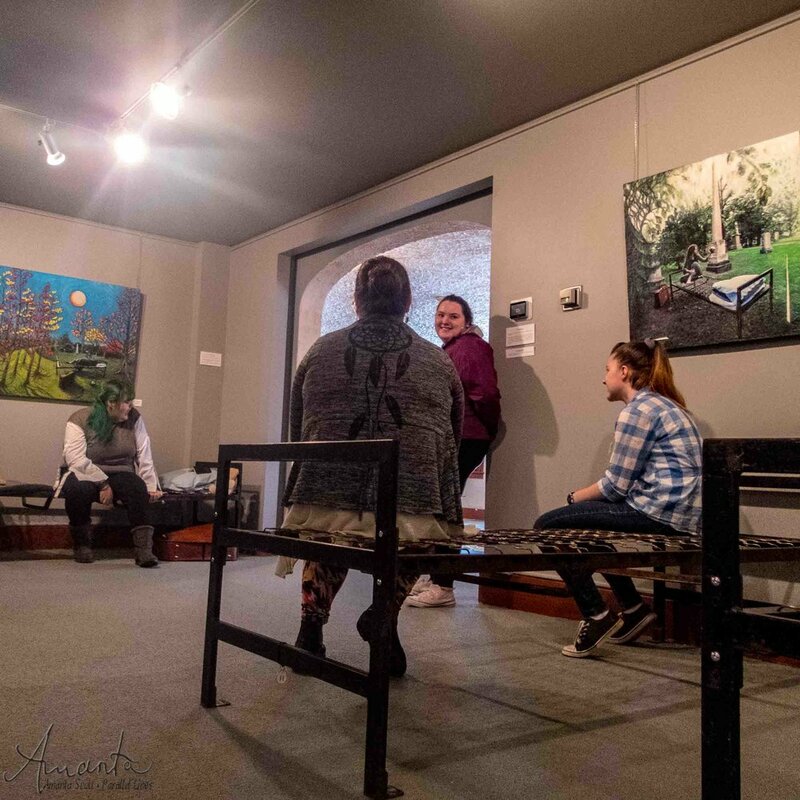 Canadian Mental Health Association, Cochrane Temiskaming Branch partnered with LeadingTone to assist at Amanta Scott's exhibition of Parallel Lines at Museum of Northern History, March 2018. Counsellors were on hand, present in the gallery, ready to speak to anyone who became emotionally affected by the works. The kindness and ongoing support of CMHACT counsellors helped many Visitors to the exhibition. This installation was created in honour of her best friend who recently took her own life. 15 Minutes of Fame also stimulates discussion about alienation and community, balancing traditional ways with contemporary culture, finding one's faith and following one's path. Visitors may open the suitcase, arrange the contents on or around the bed to create their own artistic installations, share their stories with onlookers, write their story in the Book of Fame, document their installation through photography or request the gallery do so; and view and comment upon their creations again when they are posted online.
. . . more on 15 Minutes of Fame . . . Visitors may walk on the eggshell path, meditating on what they seek in life. They may also add eggshells to the path; and, if so desired, write a message on velum, crumple it and add it to the path of eggshells. Visitors find this to be a surprisingly cathartic experience. The Visitor walking on the shells is holding a key with the words "support" written on the tag. This is something she seeks in life. She was extremely anxious about walking down the path. Her friend offered to walk along the path with her, effectively supporting her. The Visitor has now proven to herself that she can find what she is seeking.
. . . more on Fragile . . . Visitors may select from keys provided, or supply their own, write a word in two languages on the manila tag, and tie the key and tag to the prison bed.
. . . more on Esperanza . . . Visitors may participate in a group discussion session, facilitated by the Artist, in the gallery or online following exhibitions — exploring various symbols in the exhibition (bed, suitcase, frame, prison) from an artistic, emotional, social, psychological, spiritual and cultural perspective.
. . . more on sharing circles . . .
A quiet space is included for personal meditation and reflection. Visitors may also document their stories and their reactions to the exhibition on video or digital voice recording. Visitors may participate in Artist-led art workshops, conducted at the gallery or in the community. Participants learn creative problem solving and team working skills, and express who they are and what matters to themselves through storytelling, found object sculpture and oil painting.
. . . more on workshops . . .